Originally called Prayag, Allahabad is located on the confluence of river Ganga and Yamuna in the state of Uttar Pradesh. 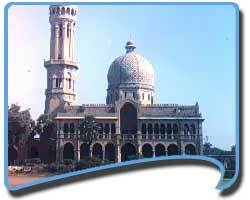 One of the most traversed tourist destinations in India, Allahabad is a bearer of the rich heritage of India’s past. A major pilgrimage site of the Hindus with the two of the chief rivers flowing by, it witnesses the influx of numerous tourists from various corners of the globe. Having existed as a town as early as 600 B.C as Prayag, the city of Allahabad offers several sightseeing options to the visitors. The Sangam, situated at a distance of 7 km from Civil Lines, is the junction of three sacred rivers-the Ganga, Yamuna, and the mythical Saraswati. It becomes the venue of the Kumbh Mela, which is held here after every 12 years. On your tour to India and a subsequent trip to Allahabad you will find that the area in and around the city is replete with several places of tourist attraction, both religious and historical. Jhusi (also Pratisthanpuri) is a tranquil place with many ashrams and temples. Hardly at 9 km from Allahabad, it is a favorite among the tourists. Another of the notable tourist attractions in India is Kaushambi (62 km), which finds place even in the great epic, Mahabharata. On the banks of the Yamuna River lies the archaeological site of Bhita (20 km). The greatest of the tourist attractions in Allahabad is the Kumbh Mela. The four venues of this grand event are Allahabad, Nasik, Ujjain and Haridwar. The Sangam in Allahabad sees the Kumbh Mela in every 12 years. Easily reachable via air, rail and road from the chief Indian cities and states, Allahabad is considered as one of the major tourist destinations in India. www.touristplacesinindia can organize various types of transportation in accordance with your requirements and preferences providing a comfortable journey to and in Allahabad and all the way through the state of Uttar Pradesh.